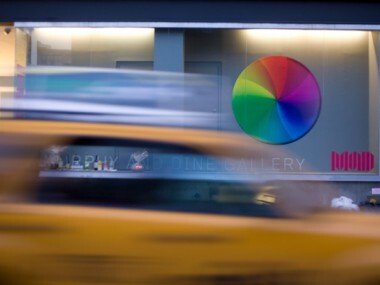 YOU control the pinwheel of death in the first-ever iPad™ art installation, “Waiting for Google,” now on view at the Murphy and Dine Gallery in New York City. You can speed it up, slow it down, stop it or even make it go backwards, but you can’t make it go away. “Waiting for Google” is artist Brian Kane’s magical, game-changing creation, which celebrates waiting and uncertainty in today’s force-quit world. The exhibition explores the transfer of virtual experiences into the real world via monumental sculpture in a relaxed corporate-casual style. 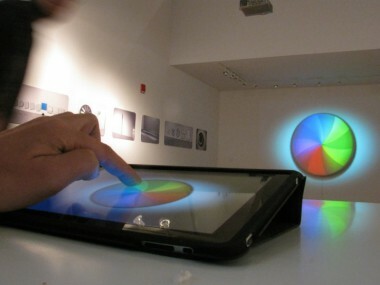 The user interface is elegant, intuitive and universal. There are no buttons to push. Just touch and control. It’s that simple. Additional contents may include: foam anvils, pi to the millionth digit, sofappropriate prints, Mini MeatWater™, eXperimints™, PBJectors™, gift baskets, and more! 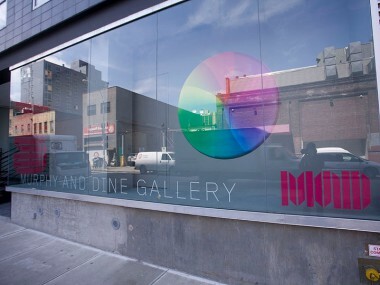 You’re invited to the closing party on Thursday evening, May 6 at the Murphy and Dine Gallery’s Chelsea location – see http://www.facebook.com/event.php?eid=342198835895 or http://blog.slashboing.com/bk/2010/03/10/waiting-for-google-murphy-and-dine-gallery/ for more info. I look forward to seeing you there! Big thanks to Gardner Post, Till Krautkraemer, Scott Chasteen, Jose Rojas, the Liquid Innovations team and everyone else who helped put this together, and apologies to Samuel Beckett. For those technically inclined, check out this great tutorial on coding video out on an iPad by Jose Rojas.